That quote about sums up the topic of hand tools as well. Where a process gets frustrating with the lack of a tool, it gets even worse when you find the ones you brought are not up to the task. A beginning woodworker doesn't need a zillion dollars worth of tools to get started. But some will prove essential in getting any job done. There are multiple variations on these that will increase efficiency once your skills progress, but among the many good things about these tools is the fact that your workshop will never outgrow them. Keep in mind that you can always add more tools to the box when the need arises. We like to think we'd finally gotten good at this when we no longer had to add a new tool to the workshop in order to complete a project. Screwdrivers. For about $20 you can get an assortment of quality phillips and slotted screwdrivers. West Hills Wood strongly recommends Craftsman for the simple reason that they make a solid product. And regardless of how badly you abuse it, a free, guaranteed replacement is awaiting you at the local Sears store. Just take it back and swap it out for a new one. Can't beat that. 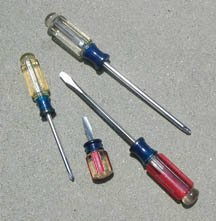 There are specialty screwdrivers out there as well as some designed for woodworking (presumably if it has a wood handle, it is special) but the job remains one of twisting a screw into a given location. Even after you get a cordless drill/driver, you will still find need for the hand held variety. Buy a pre-packaged assortment of Craftsman screwdrivers and you will have a quality set that will last forever. Hammers. You will soon discover that not all hammers are created equal. Our local Lowes store has a wall of them. Don't let it scare you off. Most are priced in the $15-$25 range and you only need a couple to get started. Think about what size nails you will be driving and chose a hammer that fits. A basic 14-oz. claw hammer will enable you to tap a few nails, hang a few pictures, and build most projects. 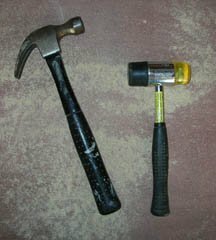 Consider purchasing a dead blow hammer. Assembling projects often entails a bit of tap and wiggle of wood parts into tight places. Tapping pieces with a rubber dead blow hammer will reduce your chances of damaging the wood. A framing hammer weighs in at 22-oz. and is well suited to driving large nails into 2x4s. You won't need or want one for most woodworking projects. Saws. Regardless of how many power tools you eventually acquire, there will always rise an occasional need for a hand saw. 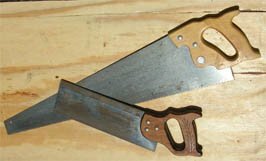 Buy yourself a basic crosscut saw and back saw. You'll know them when you see them. Of course you can use a hand saw to dimension your wood. You probably should do it once or twice. Then go buy a circular saw and your woodworking life will get a lot more enjoyable. Much of the world was built with hand tools. That's because they didn't have any choice. Measurement. Combination square and tape measure. We don't mean to be cute here, but if you don't know what these are already you should consider doing something besides woodworking. Other. Here's where it starts getting complicated. Some folks will tell you that you can't call yourself a woodworker if you don't regularly operate a plane, chisel, spokeshave, or carving instruments. So how about we call ourselves "beginning woodworkers" and go from there. Jeez, what the heck is a spokeshave anyway? The fact remains that you will eventually acquire the physical and actual shop, power, and hand tools needed to complete whatever projects you can dream up. Cabinet makers, furniture builders, and woodturners all use similar, though decidedly different tools. As your tastes develop, your preferred implements of wood alteration will reflect it.